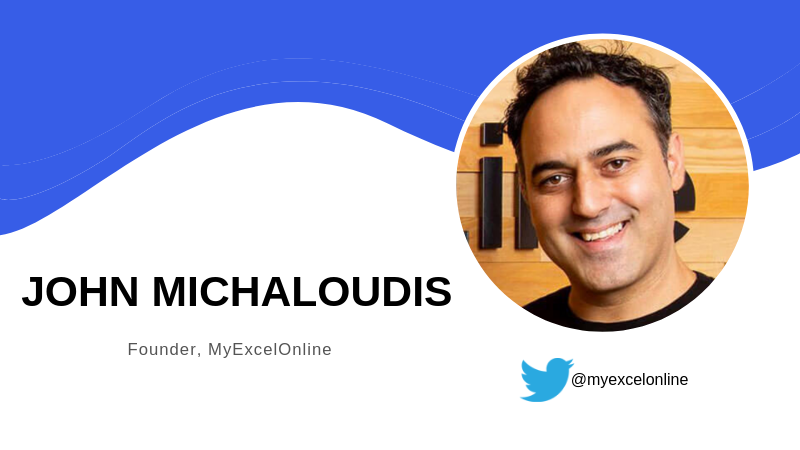 John Michaloudis is the founder and chief inspiration officer of MyExcelOnline, an online resource for Excel users looking to learn via webinars, online courses and podcasts. He began writing an internal Excel newsletter while working for General Electric before he realized there was a massive demand for help with the software app. Michaloudis spoke recently with Excelchat about how Excel helps you stand out, as he did, in the workplace and why AI is behind the latest new benefit for Excel users. What are the most common Excel challenges or issues people come to you needing help with? As Excel is a feature-packed application, I get lots of questions each day about how to create a formula, a pivot table or write some macro code. There is no common question as each person uses Excel differently with their unique business dataset, so there are varying questions that come in. You frame your marketing in an interesting way. You encourage those looking for a new job or promotion to learn more Excel skills. What’s behind that approach? Excel is a must-know application in each organization, and it’s one that is underutilized. Lots of people are pushed into using Excel and have little or no knowledge at all. There are over 800 million Excel users and less than 5 percent really know how to use it to its full potential. That’s massive! Whenever going for a job interview, Excel is a prerequisite for admin, finance, accounting, sales or managerial jobs. So it is a skill that must be learned if you are to make it to the 2nd round of interviews or considered for a promotion. If you know Excel, the chances of you getting these opportunities versus your colleague who has no idea about Excel increase dramatically. If you can show that with these skills you can save the company time and money, then you will always be employable. How do you help students who are intimidated by Excel? What can people do first to become more comfortable with it? We have various free step-by-step blog tutorials with downloadable workbooks on all the different Excel features which people can download and practice. We also have three free Excel webinars on formulas, pivot tables and macros & VBA. We show them how to use each feature within one hour, give them a free workbook so they can practice and they are amazed at the amount of content that they have learned within that one hour! To become better at Excel, you need to practice what you have learned with that data at your work, make mistakes, practice, make more mistakes and then very quickly you will become an Excel expert! Excel is very easy to learn. Do you have a couple of favorite tips or tricks that you can share? One of my favorite tips is to turn your data into an Excel Table by pressing CTRL+T. Excel tables are very powerful and make your analysis and formula creation a piece of cake. How did MyExcelOnline.com come about? At the corporate level, what are some of the common needs businesses have with Excel? How do you help? I started MyExcelOnline.com back in 2014 in order to help the masses learn Excel. I was working at General Electric at the time and had an internal Excel Tips blog, which had over 10,000 employees subscribed around the world. That was my a-ha moment … to create MyExcelOnline.com in order to be able to share my Excel knowledge, tips and resources to a larger audience. At the corporate level, people use Excel to quickly analyze lots of data that gets downloaded from their enterprise resource planning (ERP) system like Oracle, PeopleSoft, SAP or MYOB. Excel allows the user to quickly and accurately create ad-hoc reports, charts and further analysis that is not possible with these ERP systems. I help show people the different ways that you can get to a solution using Excel. What are the most important changes Microsoft has made to Excel recently? Why are they important? Excel has recently introduced a new artificial intelligence feature called Ideas. If you have a large data source with your customer orders, you can click on this feature, and Excel will open a pane to the right and create various charts analyzing the data for you. You can easily see the most profitable customers, top 10 customers, various customer trends and many other insights that are automatically created for you. Just click on Insert Chart and Excel does that for you on a separate sheet with a pivot table. No more manually creating these reports and you are seen as an analytical expert, even though you may not be one … just yet. Excelchat delivers customized, personalized Excel solutions on demand that drive business efficiency. To learn more about how we can solve your most pressing Excel challenges, contact us today.